Lunæ, 26 die Februarii, 1676. JANE Penrodok this Day took the Oaths of Allegiance and Supremacy, at the Clerk's Table, in order to her Naturalization. 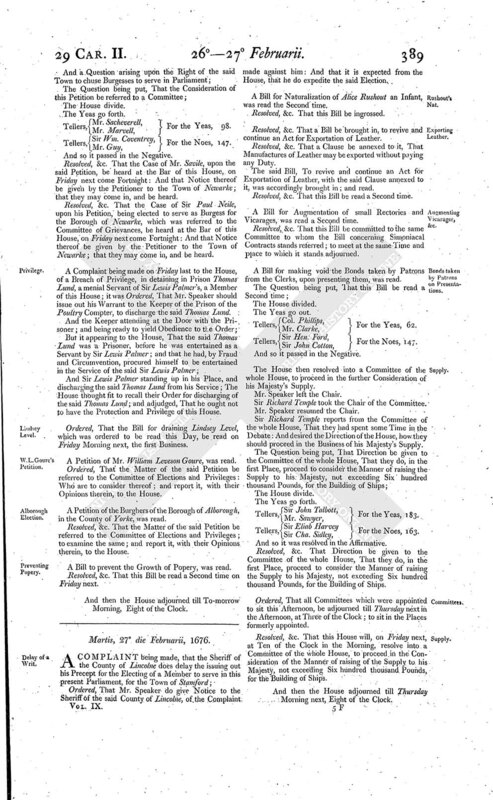 A Bill to enable Trustees to sell Lands for Payment of the Debts of Thomas Berkeley Esquire, was read the Second time. Resolved, &c. That this Bill be committed to Sir John Barnaby, Sir Henry Ford, Mr. Serj. Maynard, Mr. Crowch, Sir Tho. Allen, Mr. Williams, Sir Wm. Smith, Mr. Greeneville, Mr. Tregonwell, Sir Cha. Harbord, Sir John Mallett, Mr. Boscowen, Sir John Coventrey, Mr. Powle, Sir Tho. Bludworth, Sir Edw. Seymour, Sir Wm. Portman, Mr. Westphaling, Sir Joseph Tredenham, Mr. Walker, Sir Francis Clerke, Sir Tho. Williams, Mr. Morrice, Mr. Maynard, Sir Lanc. Lake, Mr. Eyres, Sir Trevor Williams, Sir James Smith, Sir John Knight, Mr. Prideaux, Sir Fra. Windham, Mr. Mallett, Sir Wm. Coventrey, Mr. Sacheverell, Sir John Cary, Sir John Talbott, Mr. Seymour, Sir Coppleston Bampfeild, Sir Edmund Jennings, Sir John Coriton, Mr. Rashley, Sir Richard Everard, Mr. Price, Mr. Harris, Mr. Neale, Sir Edward Mansell, Mr. Linfeild, Mr. Gwynne, Mr. Westphaling, Col. Phillipps, and all the Members of this House, that serve for the several Counties and Boroughs of Devon and Cornwall: And they are to meet To-morrow at Two of the Clock in the Afternoon, in the Speaker's Chamber: And they are to examine the Value of the Estate, and the Reality of the Debts; and for what, and when they were contracted; and whether such as are concerned in Interest, are consenting: And to report the same to the House: And they are impowered to send for Persons, Papers, and Records. 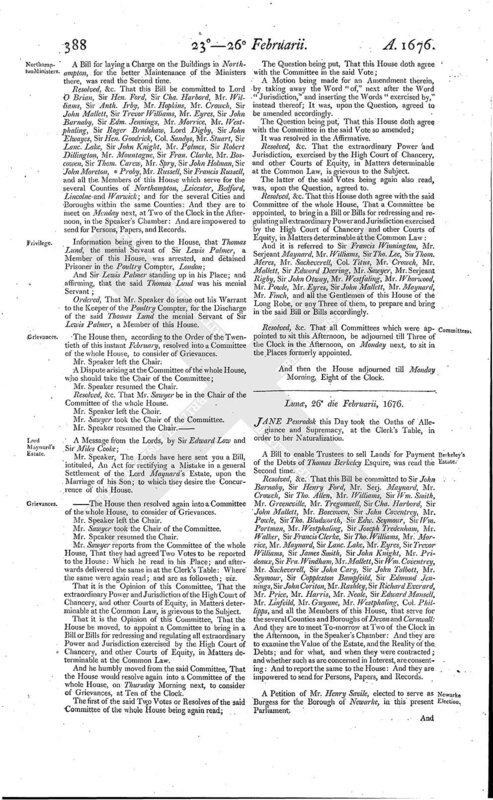 A Petition of Mr. Henry Savile, elected to serve as Burgess for the Borough of Newarke, in this present Parliament. Tellers, Mr. Sacheverell, For the Yeas, 98. Tellers, Sir Wm. Coventrey, For the Noes, 147. Resolved, &c. That the Case of Mr. Savile, upon the said Petition, be heard at the Bar of this House, on Friday next come Fortnight: And that Notice thereof be given by the Petitioner to the Town of Newarke; that they may come in, and be heard. Resolved, &c. That the Case of Sir Paul Neile, upon his Petition, being elected to serve as Burgess for the Borough of Newarke, which was referred to the Committee of Grievances, be heard at the Bar of this House, on Friday next come Fortnight: And that Notice thereof be given by the Petitioner to the Town of Newarke; that they may come in, and be heard. A Complaint being made on Friday last to the House, of a Breach of Privilege, in detaining in Prison Thomas Lund, a menial Servant of Sir Lewis Palmer's, a Member of this House; it was Ordered, That Mr. Speaker should issue out his Warrant to the Keeper of the Prison of the Poultry Compter, to discharge the said Thomas Lund. And Sir Lewis Palmer standing up in his Place, and discharging the said Thomas Lund from his Service; The House thought fit to recall their Order for discharging of the said Thomas Lund; and adjudged, That he ought not to have the Protection and Privilege of this House. Ordered, That the Bill for draining Lindsey Level, which was ordered to be read this Day, be read on Friday Morning next, the first Business. A Petition of Mr. William Leveson Goure, was read. Ordered, That the Matter of the said Petition be referred to the Committee of Elections and Privileges: Who are to consider thereof; and report it, with their Opinions therein, to the House. A Petition of the Burghers of the Borough of Alborough, in the County of Yorke, was read. Resolved, &c. That the Matter of the said Petition be referred to the Committee of Elections and Privileges; to examine the same; and report it, with their Opinions therein, to the House. A Bill to prevent the Growth of Popery, was read. Resolved, &c. That this Bill be read a Second time on Friday next. And then the House adjourned till To-morrow Morning, Eight of the Clock.